That’s how I can best sum up my feelings about what happened when we recently packed up our lives and moved to Georgia, only to move back within the week. And while we are still weathering that storm, trying to make sense of it all, trying to learn from its harsh, hurtful, and very expensive lessons…I know that storms are a mere hiccup and that sunny days will prevail. That being said, I want to celebrate my return to Blogland after a two-month absence with a bright, colorful, cheerful summer tablescape. Summer is definitely a time for bright, tropical-flavored colors. 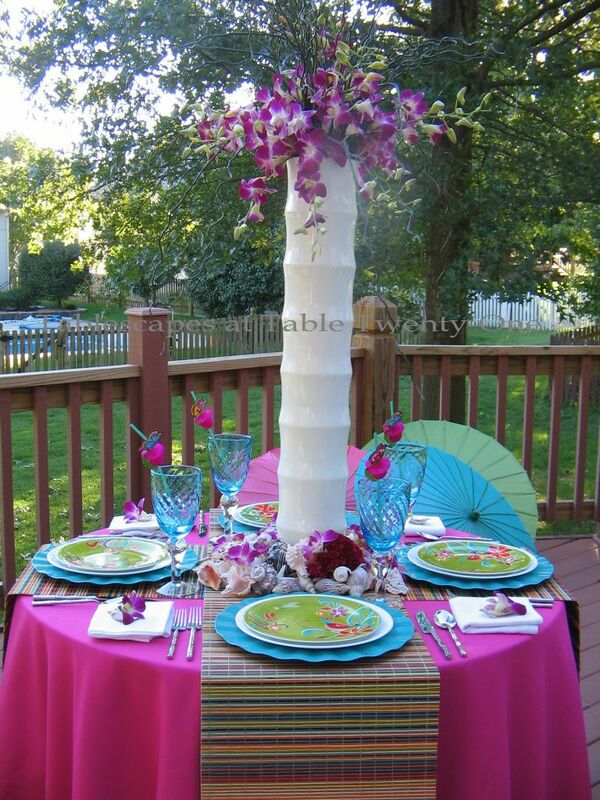 This table for four started with a shockingly pink floor-length table linen from LinenTablecloth.com. (A word of caution about LinenTablecloth: In my experience, their customer service is just horrible at times, so choose wisely and read the fine print!) 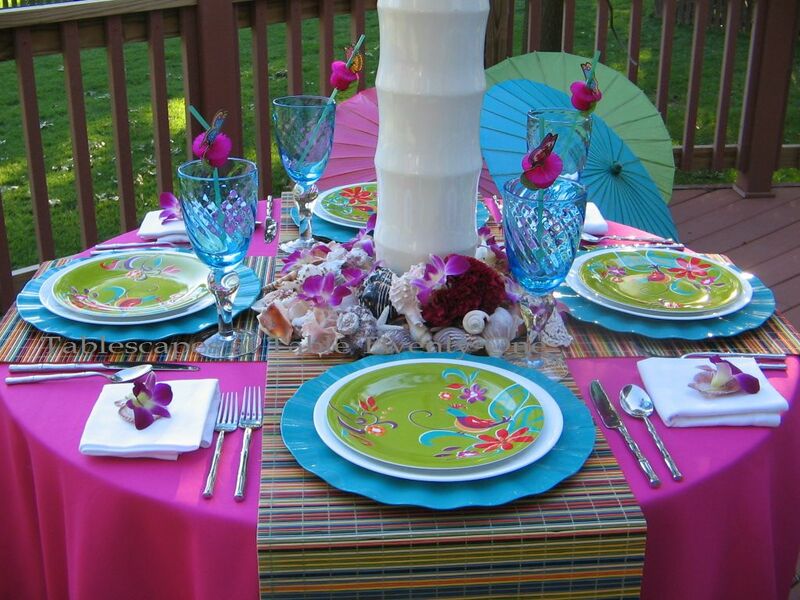 A pair of Pier 1 multi-colored matchstick table runners crisscross to anchor the setting. 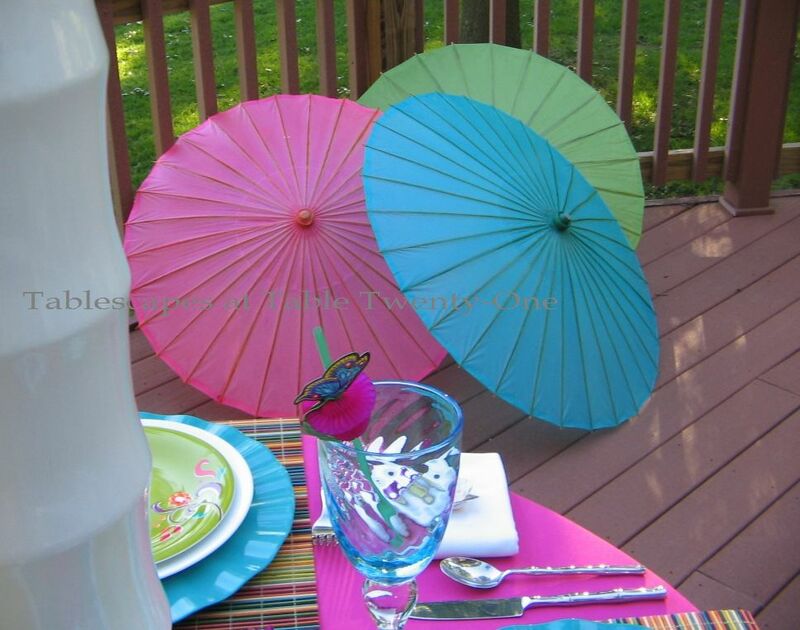 A trio of paper parasols from Hobby Lobby extend the table colors across the deck. 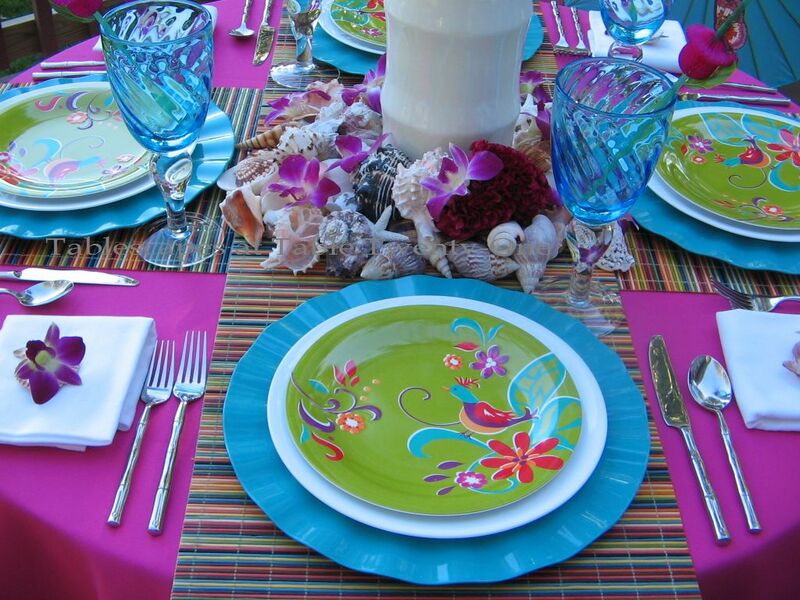 These have got to be among my favorite summer dishes: ruffled melamine chargers in aqua (Crate & Barrel), topped with a simple white Corelle dinner plate to break up the color a little, finished off with a fun tropical-themed salad plate from Pier 1. The stainless “bamboo” flatware is from Target. Exotically swirled aqua in the Pier 1 stemware reminds me of the ocean. 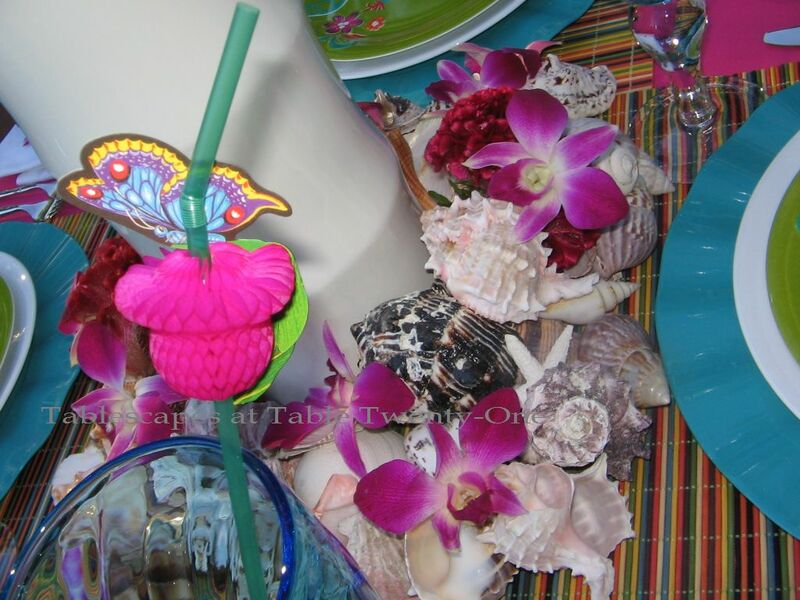 The butterfly-meets-flower straws are also from Pier 1. 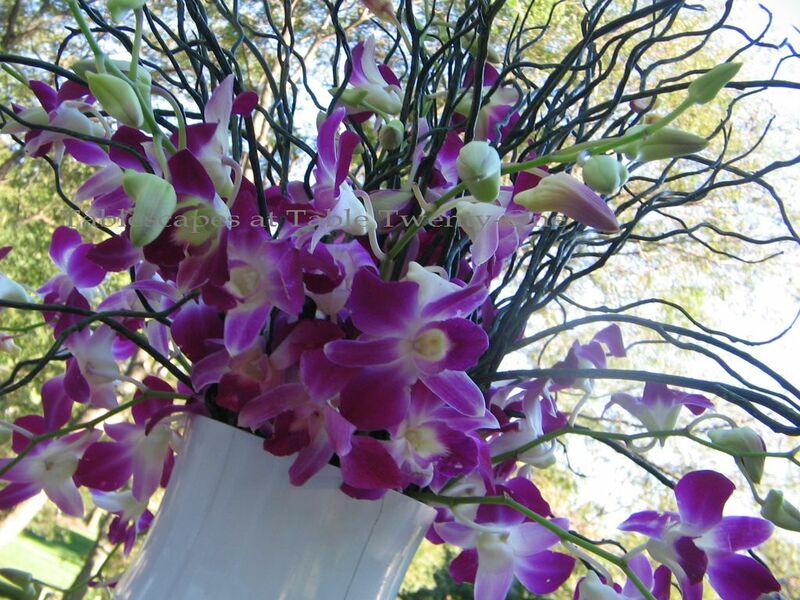 This lush profusion of fabulous orchids – courtesy of my dear friend Craig Sole of Craig Sole Designs – are arranged in an untamed fashion along with curly willow branches that lend height and texture. I’ll end this post with one more quote (expletives redacted) from author Kelly Cutrone: “This is an important lesson to remember when you’re having a bad day, a bad month, or a [$&!##%] year: Things will change. You won’t feel this way forever. And anyway, sometimes the hardest lessons to learn are the ones your soul needs most. I believe you can’t feel real joy unless you’ve felt heartache.” Amen, sister! It’s great to be back! Thank you for stopping in, and please be sure to join me this Thursday for Tablescape Thursdays hosted by Susan at Between Naps on the Porch. You’ll be glad you did! ← Tall & Toile, Y’all! Hi there! I’m glad you like the post. I have been sitting on it for nearly a year. Never a chance to put it up. This “time off” has given me that opportunity. I’m OK with coming back home, although I wish it could have been under much different circumstances. Thanks so much for stopping in, and I want to be sure you know how much I enjoyed your ice cream post! My husband is now all wound up about getting one! Have a great week, and thanks again! Hi, Barbara! I’m not sure if you got my message before. This WordPress thing is acting crazy this afternoon. It’s sending my replies to unintended recipients. Not sure what that’s all about! But I do want to thank you for stopping in and for your support. It has been rough and ugly, but I’m glad to have something nice to come back to. Have a wonderful, wonderful evening! Hooray! You are back to Blogland! You are so right, you will wonder how you got through it, but you will ! The table is gorgeous! I have the chargers in hot pink and yellow from Ze Christmas Tree shop, ever so chic! The vase is amazing! Love all the colors, very nice indeed! Let your spirit heal, prayers for you both! Hey, Kathleen!!! I have these chargers in the hot pink and lime green, too. LOVE them! I think I’ve only used the pink ones last year. Just never enough time to use everything! The yellow sounds fantastic! I would go nutso over those!!! Thanks for being there for me. I really appreciate it. We are going to get through all of this one way or another. With the love and support we’ve received, nothing but good can come our way. Take care! Hi, Christine!!!!!!! We are indeed the Z Gallerie Girls!!! Every time I’m in that store I lose my mind!!! I won’t be doing much shopping for awhile, but goodness knows I have enough stuff from Z Gallerie (and everywhere else!) to last a good long while!!! It’s good to be back. Thank you for stopping in! Yay! So glad you’re back. This is beautiful! LOVE the colors! Hey, Diane! Yes, ma’am, I am back on the circuit! Glad you like the colors….they are so bright! Almost a little overwhelming when I think about it. But, hey…it’s summertime!!! We all need a little bright to shake our fist back at the sun! Hey, Barbara! Yes…I’m back! Thank you for ALL of your incredible support and love that helped me to get back here a whole lot quicker than I thought I might. You have been too wonderful for words, and I will never forget it!!! Thank you, my dear Marlis! I appreciate it so! I was fretting about when I might ever post these from last year (I have 4 or 5 that never made it), but I guess everything happens for a reason! We won’t be entertaining around here for awhile, so I’ll just post those from last year that got tucked away and maybe do some “fantasy” tables. That will sustain me until we’re back on our feet. I so appreciate you and your friendship. Have a lovely evening, my sweet! Your words are so lovely and so comforting. All of blogdom missed you and welcomes you back. You can’t know how you were missed. Let the healing begin!!! Remember…..we’ll be each other’s cheerleaders!!! Rah! Rah! Rah! Give me and L! Give me an I! Give me an N! Give me a D! Give me an A! What does that spell? LINDA…MY BUDDY!!!!!!!!!!!!!!! It’s good to be back. Thank you so much! I’m sending good karma your direction. (Yes, I’m willing to share!) Have a wonderful day!!! Welcome Back Alycia! I’ve missed you. I hope your mojo completely returns real soon. Yes life can hold some tough lessons. Sometimes we just have to pull ourselves up by the bra straps and go forth with a smile on our face until things do get better. This tablescape is so colorful and happy it definitely brought a smile to my face. Thank you for sharing. Pull ourselves up by the bra straps….I love it!!! I don’t know how much pullin’ I can do of these puppies without breakin’ my wrists, though! 🙂 I am so glad you like the tablescape. It was one of my very favorites (and hardest!) to do. I learned a thing or two about weighting down top heavy arrangements! I had the whole thing put together before I realized that it may topple over. I had to take it apart, fill the doggone vase with sand, then put it all back together again. What a pain! But the results were worth it! Thank you for being here for me, sweet girl! Talk to you soon!!! Magnificient, Alycia! I can’t believe we (unknowingly) waited so long to behold this stunningly colorful, and oh-so-clever, table! It was, however, well worth the wait! Love, love, LOVE the festive paper parasols! The curly willow mingled with the orchid blossoms? Pure drama, a revelation! It makes my heart ache to think of the upheaval you’ve endured in the past couple of months. Please know you’re loved and appreciated in Blogland. We’ve missed your talents, your warmth, and your delightful sense of fun! I’m so glad you’re posting again! How corny is it to talk about life, lemons, and lemonade? If sour grapes could evolve into a magnificent, glorious, opulent tablescape, you’re just the lady to make it happen! Can’t wait to see the next installment. Bill, my sweet!!! How are you??!?!?!! I am so happy to hear from you! I’m glad you like the drama of the table. I wanted it to turn a head or two. By the time I got that thing weighted down (I just knew it would topple over during dinner if I didn’t! ), I felt like it needed to stay up there on that table forever!!! I’m gettin’ old, and I can’t just hoist those bad boys up there in one swift motion like I used to! 🙂 Thank you so much for ALL of your support and hugs and love during this crazy, heartwrenching time. We are taking it a day at a time. You have been nothing less than sweet as pie, and I appreciate it. Thank you, have a wonderful week, stay cool (ha! ), and I’ll talk to you soon!!! So glad you’re back! 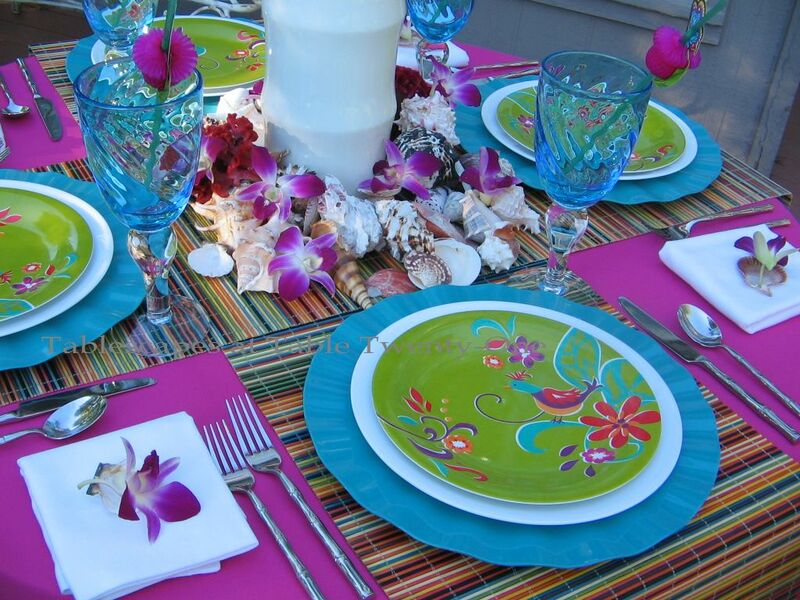 This table is spectacular — what wonderful, tropical colors! Love the ruffled chargers — my daughter has them in lime green. And the TALL centerpiece looks amazing! It sounds like your last couple of months have been really tough — hugs! Hey there, Tricia! I have them in the lime green, too, as well as the hot pink. I absolutely love how “frilly” they look without being too “girly.” And I’m so glad you like the centerpiece! I remember struggling with that thing! It finally occurred to me that I was going to have to weight it from the inside to keep the top heaviness from tilting it over on top of my guests! It was SO heavy!!! But as long as it looked good….! 🙂 Thanks for the hugs, and I’ll see you soon! Wow, what a beautiful tablescape! I sure missed your posts! Glad you are back! Literally! Sorry for all your turmoil and upheval. Hope you are settled again real soon! Those colors are amazing!!!! Debby! How ya doin’!??!?!?!! I’ve missed you!!! So just what did we deserve to get this kind of heat around here? Horrible, isn’t it? At least we have our dishes to play with…indoors!!! 🙂 Thanks a lot, and I’m glad to be back. Life has been pretty rough the last couple of months, but I have my husband, my health, my home, my family and friends…it’s all good, as the kids say! I hope things are hoppin’ in your world, and I’ll see you soon! Take excellent care! Yea, you’re back!! Hoorah!! Such a fun, cheerful, happy tablescape, just perfect for brightning the day and lifting up our spirits with this awesome vase and orchids–sounds like you may have gained some muscle with this baby!! Well worth it, it’s very dramatic. 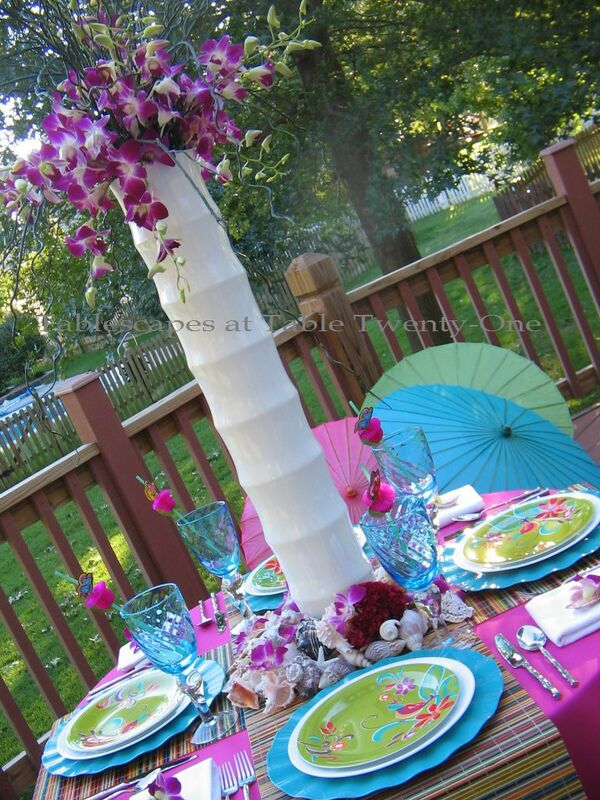 The colors are soooo gorgeous together, the parasols are fantastic. Hmm, wonder if Crate and Barrel still has those fantastic chargers!! You have been missed, and I look forward to seeing those other posts you have hidden away!! I always learn something. Hang in there, we’re all here for you!! Oh, bless you!!! Thank you so much!!! You make my day…and not in a Dirty Harry way! 🙂 Wait a minute…that rhymed. I AM back! Hooray!!! 🙂 🙂 🙂 I’m not sure if Crate & Barrel still has those chargers or not. I haven’t been in that store at ALL this year. The temptation is far too great! I got the chargers in the aqua, pink, and lime green. I only got 4 of each, though. I thought they were a little bit pricey. I can never seem to catch a really good sale at C&B. Anyhoooooooo….I’m so glad you stopped by to take a peek at my “resurrection tablescape.” I hope to never be gone for that long again. Take care, and I’ll see you on TT!! Oh my how beautiful. Such a happy and cheerful table. Thanks for sharing. It all looks so inviting. All I can say is wow. Popping with color. Donna!!!!!!!!!!! Thank you! Thank you so much!!! Now I just have to get back in the mood to do some more. I only have about 4 or 5 on reserve, so I’d better get my act together quickly! Have a great weekend, and thank you again!!! Well, Dianne, I will be heading to a pawn shop or two as soon as the weather cools off here. I just can’t brave this heat. It’s just horrible!!! Meanwhile, as much as I adore my home, my dining room just cannot compare to yours. It is magnificent! The proportion is incredible and just what I need. You were wise to convert the sunroom! What a great idea!!! It is so good to see you again, Alycia. Missed you so much! I’ve thought of you so often over the past months. Wishing you all the very best!! Thank you, Pat! See you soon…if I don’t burn to a crisp in this heat first! What a fun table I just love it. Thanks for stopping by and I am excited to explore some more around your site. Great ideas! I have visited the tropics! So colorful I love it! I am sorry to say I didn’t know you were “missing” but I am glad I found you NOW! You killed me with your pink table clothe just loved it!!!! Your table setting is just beautiful. Thank you for sharing, now I’m dreaming that I’m sitting at that table and having a wonderful meal. Thanks, Poppy! I’m so glad you enjoyed it! Alycia, so sorry for the disappointing move to Georgia, bet you are glad to be back home, though…so happy to see you are back to blogging again…you were missed. That table is magical! I love it…glad to see someone else isn’t afraid of color. I ♥♥♥ the stemware. Hi, Marigene! Yes, it was disappointing to say the very least, and I am SO glad to be back home!!! SO glad!!! Thank you for stopping by today. I really did miss sitting down each week to get an eyeful of all the pretty tables and share in the comraderie. I am pretty sure I won’t be setting foot off of Missouri soil again in my LIFE, so I’ll be seeing you each week. Take care, thanks again for stopping in, and I’ll see you soon! This is absolutely FABULOUS!!! I love the vivid colors….all the elegance AND playfulness…I love that amazing centerpiece that provides such visual height/interest!!! And thank you so much for your wonderfully kind comments about Alexandra! When you get a chance, please tell me about your musical life!!! Hi, Lana! I’m sorry…misunderstanding. No musical life here other than playing piano. You would NOT want to hear me sing!!! The Lyric Opera Circle is a group of women who promote and rasie money to support Kansas City’s Lryic Opera. There is a huge, opulent ball every year which the ladies of the Circle plan from soup to nuts. The opera is very well supported here. The Lyric will enjoy a new home starting this fall in a fabulous new venue built specifically with their needs in mind. Thanks for stopping by blog! I’m glad you did! Hope to see you again soon! I really like the quotes as we have had the worst several months of our lives and we are still a bit shell-shocked as we try to get back to normal. I can’t imagine what a dual move in a week would be like…so sorry you had to go through it. I hope the dust settles soon for you. This tablescape is gorgeous. 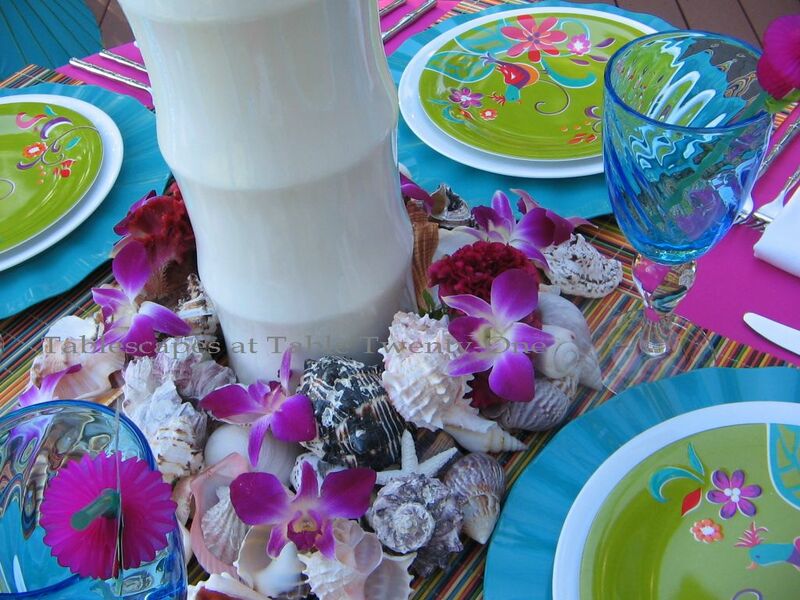 I love all the color and of course the shells…my favorite! It is a stunner! Hey….Oh, I’m so sorry to hear that the last several months have been so bad for you, too. Truly, truly sorry. Really makes us appreciate “normal”, doesn’t it? I hope the clouds blow away from over both our heads sooner than later. Thank you for stopping by my blog this evening, and have the best weekend you can. I’ll keep you and your family in my prayers. What a beautiful table! My goodness I had no idea what a horrible experience you had — I know you’re glad to be back “home” again. We missed you and your talents so much….glad to see you back again. Thank you, Martha! It was pretty bad, and it ain’t over yet. But at least we’re HOME. That’s a huge comfort in and of itself. Thanks for stopping by, and have a terrific weekend! What fun colors! My favorites are the chargers, and the blue plates, and the glasses. Well all of it really, I guess! Thank you for sharing! Hi, Christina, and thank you for stopping by to say hi! I’m so glad you like the table! Have a fun weekend!!! i am so in love with your table. Everything is just perfect. You have inspired me to try using more color in my tablescapes. Thanks! Hey there, Taunnie!!! I’m glad I could incite you to use more color!!! This time of year I REALLY need to jazz things up, and lots of searingly bright color seems to do that! Have a fantabulous weekend, and thanks for stopping by! Hey Alycia! Like so many others I’m glad you’re back with your alway wonderful tables. It appears that we enjoy picking up things from some of the same places. Z is so rich with inspiration! Whatever happened to turn your move into a nightmare will pass and it will be remembered as just one of life’s experiences. Hopefully, we learn from them all. Welcome back, Alycia! You’ve definitely been missed, but I just thought it was because you were getting settled in your new home. I’m so very sorry to hear otherwise, but I commend you on your upbeat attitude and hope that on the “low” days you’ll be able to draw strength from knowing that people you haven’t even met in person really DO care and are praying for your family. In case you need a little retail therapy to perk up your spirits, stop and check out my Vintage Linen & Dish Auction — going on now! I’m celebrating my first year of blogging. Hey, Susan! Thank you!!! There have been many, many low days, but they are coming fewer and further between now as we at least been able to get over the initial shock. As for retail therapy, there will be none of that for a long time to come. 😦 I miss it SO much!!! I missed all of YOU, too, and I’m so happy to be back. Good luck on the auction. I saw that on your blog, and it looked so cool!!! Congratulations on your 1st year (mine is coming up, too, very soon), and have a grand weekend! Hi, Mary, and thanks. Yes, it has been quite a nightmare, but at least we’re back home safe and sound. We’ll be working through this over the next several years most likely as we will probably have to sue and go to court. Ugh! 😦 Not my idea of a fun time. Anyhoooo…I’m glad you like this tabletop. I remember it being so much fun to create except for that doggone vase that had to be weighted down. In the end, though, it was a hit. That’s why we do this, right? 🙂 I hope your vacation was wonderful, wonderful and that you got to spend more time and see more of Savannah than we did! 🙂 Take care! WELCOME BACK BABY!!! You came back with a beautiful splash of COLOR! 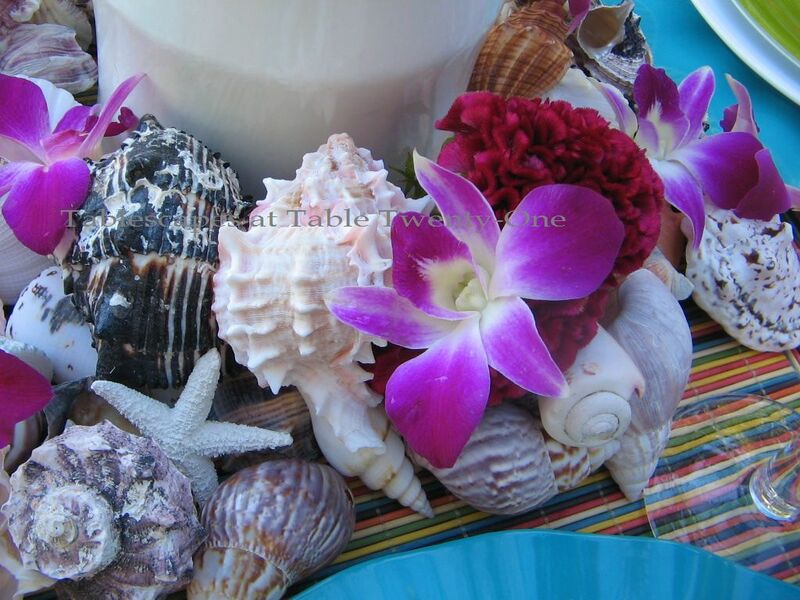 Once again, you have created a tablescape that pops and I LOVE the orchids and shells and all of the bright colors ~ it really made me feel good. Thanks! Yes, I’m back! Hooray for me!!! I TOLD you you’d like this one!!! Those orchids are amazing!! What a beautiful table! Hi there, Susan!!!!! 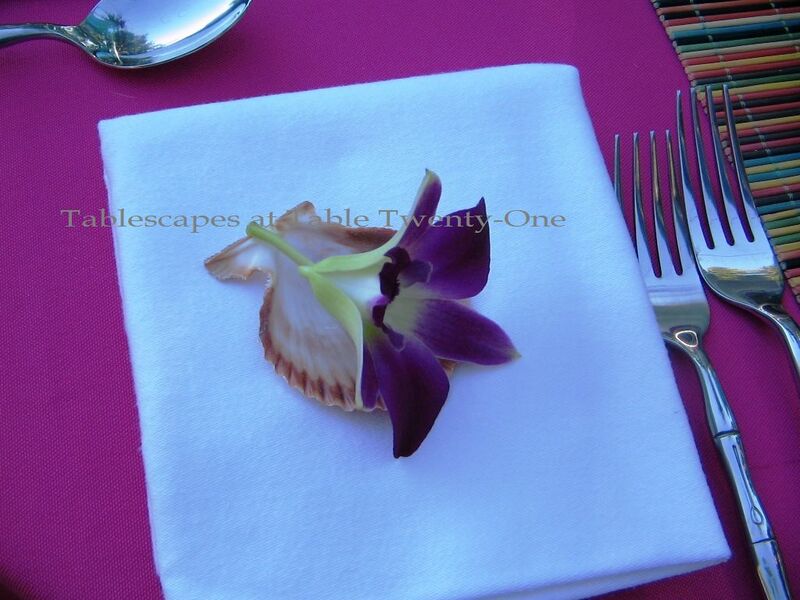 I’m glad you like the table with the orchids! It is truly one of my all-time favorites. All the bright colors remind me of all the rich, luscious colors in your community garden. Have a wonderful weekend, and thanks for stopping by! I don’t know how to contact you personally, so I’m using this public forum. Hope you still read the comments. I had never heard of Haruki Murakami or the quote you opened this post with, but it struck me right between the eyes. My dearest friend was diagnosed with ovarian cancer early this summer. After an operation to remove all the woman parts, she was to start chemotherapy just a week after you posted your Tropicana tablescape. Her prognosis is much better than originally expected and it looks like she has a good chance of recovery, but the 14 months of chemo she must face will no doubt take their toll. “Once the storm is over . . .” onto the dog tags. After reading her the full quotation, I told her to wear it every Friday, when she goes to get the chemo. She cried. So did I. It sounds as though you have been through a bit of a tough time yourself lately, but I wanted you to know that this post of yours, this attempt to find your way “out of the storm” helped to ease the turbulence in another woman’s life. Now you have me crying!!! Denise…you just don’t know. I am so glad you were able to find the words to make your friend feel special and loved and hopeful. Yes, I’ve been going through a tough time, but I am reminded of that anonymous quote, “I cried because I had no shoes until I met a man who had no feet.” What I’ve been going through, while gravely serious and difficult, is nothing compared to a fight for one’s very life. I honestly wish your friend the very best as she champions through. I have every bit of faith that she will weather this storm. Thank you for making my day. Thank you for making me feel that something I contributed – albeit so small – gave someone a reason to smile. I could just spend hours on your blog..I have a “Alycia’s Finest” folder in my email.. and just when I thought I’ve had enough.. I see more that I need to add.. chuckles.. it’ll be a encyclopedia before I know it.. Keep them coming!! This is ABSOLUTELY MY FAVORITE TABLESCAPE of all you settings. I LOVE the umbrellas!